The Wind Cave Nature Reserve in Bau, Malaysia, which had been closed for maintenance work since last year, will be partially opened to visitors effective May 14. The walkways of Passage One, Two and Three are now open with basic amenities such as toilets, shelters and platforms for visitors visiting the 6.16-hectare reserve, the Sarawak Forestry Corporation said in a statement here today. The Wind Cave Nature Reserve imposes a RM1 entrance fee for local visitors and RM5 for foreigners, in accordance with the National Parks and Nature Reserves Ordinance 1998. The reserve is part of the Bau Formation, a narrow belt of limestone covering about 150 sq km of southwest Sarawak. 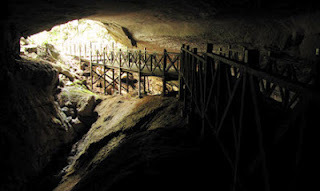 "Due to the comparatively soft and soluble nature of limestone, and the intense tropical rainfall of the region, the whole of the Bau Formation is intersected with caves," said the statement, adding that the Wind Cave was within easy reach of Kuching and is a popular day trip and picnic destination even though many caves of the Bau Formation were remote and inaccessible.